Customer experience or shopping experience is the most talked-about business jargon in the recent times in the retail environments as store owners are fully engaged to make their customers coming back for more with world-class amenities and features. One of the early trend setters was the introduction of display racks and shelves which provide customers an option to choose their products without wasting time of asking the shop-keeper to fetch the items. A few years ago, retail stores were using less attractive concrete, steel or wooden racks or shelves to keep the items and restricted customer access to fetch items directly from them. With mushrooming of supermarkets and hyper markets across the cities and towns, small and medium shop owners too are expanding their shops to compete with the neighbourhood big players by accepting modern trends to stay in the business. Customer experience is being given prime importance by retail shop owners, particularly those who are handling grocery and other daily use items, who now allow customers to select their favourite items kept orderly on attractive shelves. Apart from automating their stores with the help of modern Point of Sale system, swanky interiors with better lighting and ventilation system, store owners have changed the way the merchandise were being kept by incorporating attractive and well designed racks made of solid wood, engineered wood, stainless steel, aluminium or glass. Depending upon the space available and also the types of goods to be displayed, retailers can select either readymade racks or customized ones. For example, grocery retailer shops, electrical equipment stores, home appliance stores and medical shops can’t have the same type of rack system. Racks can be classified according to their usage – industrial storage racks and retail storage racks. 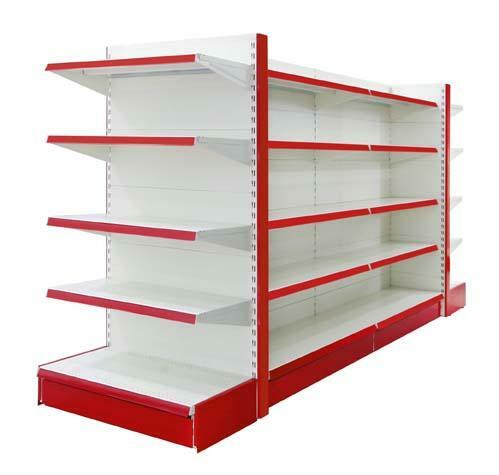 Under retail applications, racks are used for various purposes such as stocking books, grocery items, fruits and vegetables, medicines, shoes, electrical and electronic items, textile and accessories. For grocery retail business, store owners can look for racks system thinking at their in-store space availability and categories of items they are going to display. There are several modular supermarket racking solutions available and some of them are wall gondola racks, end gondolas, alligator bins, impulse racks, lighted racks, cash counter racks, ball cage racks, four sided racks, stepped back racks, mesh basket racks, glass shelf racks, corner racks and top canopy racks. These racks are either available readymade or can be made to order. Similarly, for fruit and vegetable business, vendors will find different kinds of racks specially made for holding such less weight and perishable items. Some of the racks available for fruit and vegetable stores are top canopy racks, steel vegetable racks, tube type racks, adjustable racks, Open adjustable racks, and perforated storage boxes. Vendors who want to make their store more customer-friendly should concentrate on suitable storage system to enable customers to reach their favourite items quickly. So, get the suitable storage racks for your retail store today to ensure better shopping experience for your customers.